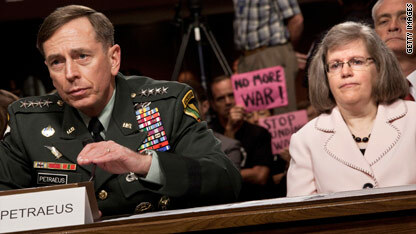 Gen. Petraeus, with his wife Holly behind him, answers questions during his confirmation hearing. Holly Petraeus sat behind her husband in the committee hearing room wearing a white suit, sharply detailed with stitching around the collar. Her shoulder-length hair and clear rimmed glasses gave her the air of a woman who took the task at hand seriously. On this day, her task at hand was to support her husband as he sat for confirmation hearings in his bid to become the next leader of the U.S. military effort in Afghanistan. Senator Carl Levin opened the hearing by acknowledging not the work and sacrifice of General David Petraeus, the incoming commander of the Afghanistan effort, but the sacrifice of his wife in supporting the incredible demands of her husband's service since 9/11. "Your wife, Holly is with you this morning, and so we all want to thank her personally for her commitment, and her sacrifices along the way," said Levin. "I must tell you general that her understanding of what you're doing, of your patriotic duty as you are now doing again, taking over command in Afghanistan, her understanding, support of that is truly inspiring. We thank her. We profoundly thank you, Mrs. Petraeus. "Senator John McCain did the same, followed by General Petraeus himself, who thanked the woman who has stood by him through some of the darkest days of the Afghan war. It is in moments like these that women like Holly Petraeus become symbols of the price paid at home since 9/11. "She is a symbol of the strength and dedication of families around the globe who wait for their loved ones while they're engaged in critical work in Afghanistan, Iraq and elsewhere," General Petraeus told the committee. "She has hung tough while I've been deployed for over five and a half years since 9/11. So have untold other spouses, children and loved ones as their troopers have deployed and continued to raise their right hands time and time again. Clearly, our families are the unsung heroes of the long campaigns on which we have been embarked over the past decade." It's a life that hundreds of thousands of families can relate to this fourth of July. Jeanine Hayden lived the life for decades as she moved from place to place with her husband, General Michael Hayden. While some families suffer the long separations from their husbands, wives, moms and dads, hers was the story of sacrificing her own career to keep her family together and support her husband's service. "I was blessed that in Mike's 40 year career, the longest separation was 12 weeks, and he wasn't going off to war," says Hayden. "I followed him from place to place whenever that was possible, and that's another sacrifice military spouses make." Hayden now sits on the board of the National Military Family Association which is one of a number of organizations that offers scholarships and assistance to military families, whether it's in the form of affordable summer camps for military children or helping military spouses get career assistance. Hayden is happy to talk about her own experience as a military spouse while she clearly understands that there are an entirely new set of stresses on families of the deployed, even when that deployment is over. "The spouses I talk with today tell me there are issues of reconnecting and reforming the family," says Hayden. "There is also the rush of adrenaline associated with being in a war zone, and when you come home, it's the mundane task of picking up milk on your way home, or taking the kids to soccer." The NMFA is one of several organizations offering support for families learning to adjust to military hardships. The Tragedy Assistance Program for Survivors (TAPS) is another. For Ami Neiberger-Miller, getting help was the last thing she wanted to do. Her brother, Army Specialist Christopher Neiberger was killed in action in Baghdad on August 6, 2007. It happened just three days after his 22nd birthday. As a Washington-based PR specialist, Ami felt like she could handle tragedy. After all, she had dealt with crisis before, from helping families through Hurricane Katrina, to dealing with the trauma of missing children, but when it happened to her own family, it was different. The military provided Ami's family the services of a casualty assistance officer, who offered a range of resources to help deal with their loss. "I thought, I won't need something like that," said Ami. "I had lots of resources through my church, but then I tried to get back into my life after he died and it was really difficult. "Ami now works as a public affairs officer for TAPS. "We intake 1-2 families every day due to suicide," says Ami. "Some of those might not be immediate, they may be families who suffered a loss a couple of years ago, but are only now ready to ask for help." TAPS keeps count of how many U.S. military lives are lost in the military efforts in both Iraq and Afghanistan. As of June 21 of this year, their counts were 4,407 casualties suffered in Operation Iraqi Freedom, and 1,125 suffered in Operation Enduring Freedom in Afghanistan. While changing the commander in Afghanistan is not signaling a change in the Administration's commitment there, the numbers will undoubtedly increase, meaning even more families this year might be seeking Ami or Jeanine's help. As for Holly Petraeus, her sacrifice will continue along with her husband's service. In his assumption of command speech on July 4, General Petraeus reached out to the men and women most affected. "I want to thank each of you - and each of your families - for the sacrifices you are making as you serve in this critical endeavor. Thanks, as well, for the skill, courage, determination, and sheer force of will that you have demonstrated - and on which we will rely heavily in the months to come." The mission isn't over yet.